A Megalithomania exploration of the mound culture, megaliths and giant-lore of ancient America. A road trip starting in New England, heading to West Virginia, Ohio, Indiana, Illinois, Kentucky and Wisconsin. We are Hugh Newman and Sheena Gaskell on a quest for the prehistoric origins of this incredible landscape. We'll be meeting researchers such as Robert Schoch, Ross Hamilton, Fritz Zimmerman, Jeffrey Wilson, David Childress and others to find out what the ancients were up to in the US of A. For a long time, it was thought giants were just part of folklore, but recent research into old documents, newspapers, journals, first hand reports, and old photos now suggest that these may have been a reality. It is the discoveries in the mounds and megalithic sites of North America that have created a huge controversy, because there are at least 1500 reports of a giant race, some with double rows of teeth, horned skulls, powerful jaws, and elongated craniums, who ruled the continent since at least 7,000 BC. They were mostly found in ancient mounds and have been reported as going up to a staggering 18 feet tall. Often they have strange bronze armour, red and blonde hair, unusual skulls and a physique suggesting that some of them may not be native to North America. Most reports range the heights between 7ft and 12 ft, but it still doesn't answer the question of why this part of history has been so meticulously covered up. From New England, to Miami, Ohio and California, these giant skeletons have been dug up in the thousands, yet when the Smithsonian Institution got involved they mysteriously vanished. The Native American NAGPRA Act of 1990 removed the final bones from museum displays, so there is now little evidence to go on, but the reports, photos, excavations and eye-witness accounts - even from Abraham Lincoln and other luminaries - suggest that the history books are on the verge of being rewritten. - How early explorers to America witnessed these giants first-hand, including Sir Francis Drake, John Smith and even some of the early presidents. - Legends and myths that talk of cannibalistic, red-haired warrior giants. - Strange inscriptions, metal armor, mummified remains, and sophisticated technologies buried with the skeletons. - Evidence of extreme antiquity, such as Spirit Cave Man, Lovelock Cave mummies, and discoveries on Catalina Island. - That secret societies such as the Rosicrucians, Freemasons and Theosophists all claim the existence of giant humans in the past as historical fact in their literature. - How the giants are connected with the Denisovans from Siberia, the Nephilim of Bible tradition, and other ancient cultures. 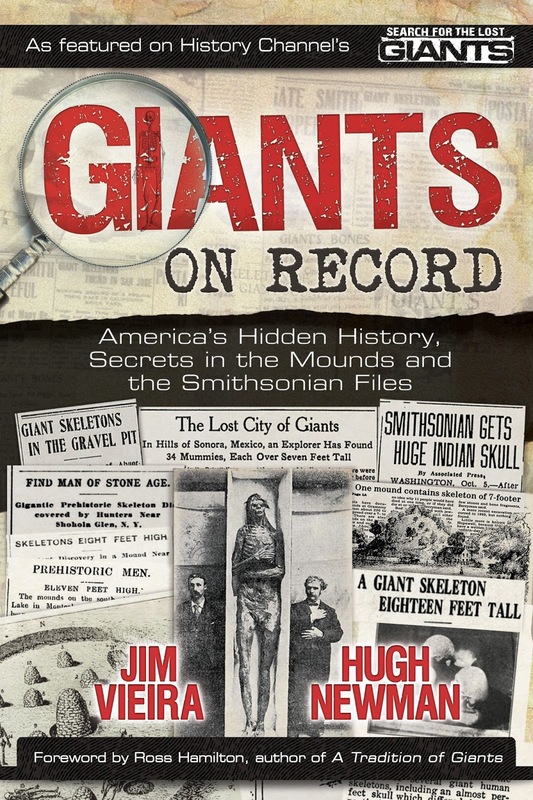 - How a major cover-up was initiated by Smithsonian scientists to suppress the existence of giants starting in the late 1800s. Jim Vieira is a stonemason and writer and has collated 1500 newspapers and scholarly accounts of giant skeletons being found in North America, In 2012 he created the online blog 'The Daily Giant’ presenting one giant report per day. He is star of the History Channel TV show Search for the Lost Giants with his brother Bill. He presented at a prestigious TedX event, but got his lecture controversially taken down just like Graham Hancock and Rupert Sheldrake. He lives in Ashfield, Massachusetts. Since 2008 I have been researching Giant reports, most notably in North America. 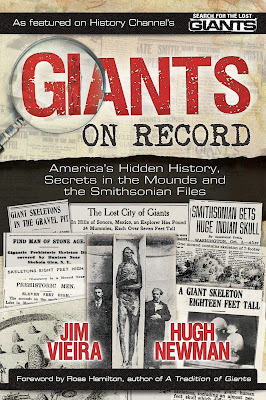 After reading Ross Hamilton's classic 'A Tradition of Giants' about the 7ft - 12ft giants who ruled the Ohio area of North America (often with double-rows of teeth), I became fascinated how myths and legends may actually be true, and give a clue to who built these sites. Since then researchers like Jim Vieira have found around 1500 reports of this unknown race from reputable newspapers, science journals, town histories and private letters. Many were excavated from ancient mounds, and some from megalithic sites. This is the first part of an hour-long interview I did with Jim last October when I was in New England. It includes interviews with Andrew Collins, and also Peter Anick from the New England Antiquities Research Association. Filmed, Produced, and Directed by Hugh Newman. Copyright Hugh Newman/Megalithomania 2013. All Rights Reserved. 9th September: After a glorious breakfast lovingly served up bt Ross' partner Lesley, we headed off to Norwood Mound, not far from Ross' house, to check out this site that has never been excavated. It was slightly elongated and was surrounded by houses. I dowsed it for earth energies and found a crossing point of three currents at its apex. Its energy was pristine and felt elated as I climbed the structure. However we were meeting Jeff Wilson and John Feiertag at Fort Ancient, a magnificent hilltop earthwork enclosure near Lebanon, Ohio, so we had to get a move on. Before I visited this part of North America, I thought there were just a few mounds and geometrical earthworks in the Ohio Valley. I had no idea there were many sites as gigantic as Fort Ancient. Two conical mounds around 20ft high, greeted us as we drove through them into the main entrance. 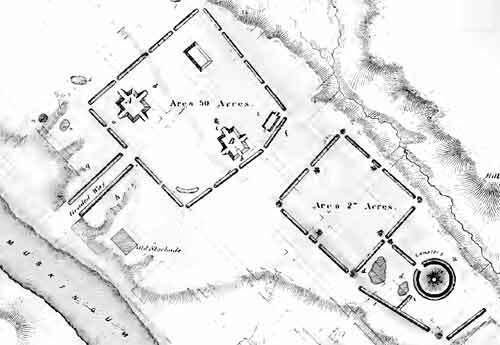 The outer 'walls' of the so-called fort, were about 15ft high (at the entrance). I noticed several notches in the outer wall, as though they were used for astronomical observation of sun and moon rises and sets, much like has been proposed at Wandlebury, near Cambridge back home in the UK. We drove in to the main complex and took a long walk around the museum with Jeff wilson guiding us around. I was impressed by the site, especially the stone mounds and three potentlal stone circles , that are still buried in the ground, yet to be excavated - but marked by a circles of small stones on the surface. The museum is an excellent introduction to the mound culture sites of North America, with an interesting collection of artefacts, pipes and weapons. What interested me the most was the exhibition that showed that happened when the Europeans arrives and detailed who did what to the Native inhabitants. It reminded me of what I had read in the 'Indian Wars' book, but the museum bought it to life. The foundations of 'America' are very odd and more violent and sadistic than I had originally thought. 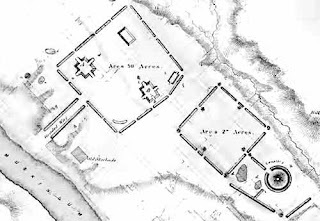 The astronomical significance of Fort Ancient is interesting, as the notches in the outer walls aligned with four stone mounds in the northern part of the enclosure. They formed a great square, plus a great wooden circle has also now been discovered, much like the one at Cahokia, Illinois. We checked out the thin middle part of the fort. This is where the three stone circles had been detected below the ground. I detected earth energies between each of the stone circles that led to the mounds. We continued to the southern part of the fort spotting a few mounds on the way and took a walk to the edge of the fort that has a sudden drop. Jeff and Ross believe the middle part of the fort may have been constructed from deep down the cliff edge. The sheer magnitude of the earthworks bewildered me and gave me another view on the Hopewell who built the fort and the later Fort Ancient people. I hung out next to the two entrance mounds, trying to detect the long parallel earthwork that looked like a cursus, that headed northeast from the two mounds. On some maps, it is clearly marked and has what looks like a serpents long body and head with a mound within it. No sign of it remains at all. We meditated there for a while then headed to Lebanon and stayed in a strangely fantastic motel (White Knight Motel) that had a swimming pool in a cage in the parking lot next to a hardware store. We decided not to go for a swim. 8th September: At 3am I heard a crashing at the windows of the room I was staying in at Roy's house in Peebles, Ohio. White flashing light and immense thunder simultaneously woke me up. It was powerful and felt like it was designed to get my attention. I remembered what Ross Hamilton had told me about the legendary Thunderbirds, who could manifest as lightning and thunder and charge up the earth energies below the surface of the earth. Had the Thunderbirds given me a warning, or a greeting into this enchanted landscape? I would find out the next day. 9th September: The next morning, we drove to Serpent Mound after an awesome breakfast cooked up by Roy. We aimed to get there on this particular day because local residents were displaying artefacts discovered on there land. We drove up the track to Serpent Mound and I was immediately drawn to a particular mound that was about 5 ft high and 15ft wide. I went to dowse it and found three energy currents meeting at its apex. I later found out that a giant skeleton had been unearthed from the mound, that was rediscovered printed on an old postcard with a note saying it was 7ft tall. However the skeleton had its shins and feet missing, so it could easily have been 8 ft. This was yet another stunning piece of evidence that the Giants were here in Ohio. 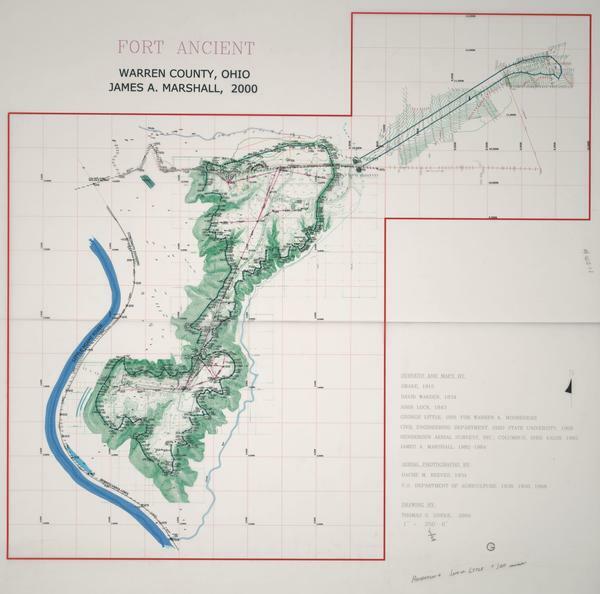 Serpent Mound sits on the southwest edge a 'crypto explosion crater' that has powerful magnetic and gravitational anomalies going deep into the earth, even as far as the mantle. These anomalies cause all sorts of weather fluctuations and earth energy effects. As with many other mound sites (such as Grave Creek Mound and Cahokia), Serpent Mound was built upon a powerful magnetic anomaly and on a fault line created by this prehistoric impact. We went up to the edge of the crater and got a panoramic view of the surrounding landscape, with local residents telling us about the strange weather patterns that affect this area. No one lives in the crater itself, because the energies are too powerful and I was told that some people have been driven mad when they did. We met up with Jeffrey Wilson, who had done a talk at Megalthomania USA in October 2011 about the Ohio sites and crop circles in the area. He showed us around some of the site and we met Delsey and his kids and picnicked with them. Jeffrey has carried out LIDAR surveys of the Ohio landscape and it has helped him discover many secrets invisible to satellite photography. Most notably, were the 'plumes' or feathers that are on either side of the Serpent. I had no idea this was a 'Plumed Serpent', like the legends of Quetzalcoatl in Mexico and Virococha in Peru. That symbols seems to appear throughout the America's and is always associated with lightning, thunder, earth energies and sophisticated ancient technologies, such as fertility control of seeds and grains. They are also said to be 'tall' and that is certainly the case with this part of North America. The late John burke had done several tests at Serpent Mound with bags of various types of seed, just after a lightning and thunderstorm, and got remarkable results when they were planted against controls. There was growth increase, faster yield and stronger plants. Again, were the legends of the Thunderbirds indications of when to place the seeds on the mound to charge them up? Jeffrey also pointed out a potential post-hole that may have aligned the mound with the summer solstice. The whole of Serpent Mound encodes a sophisticated astronomical secret, that has now been discovered and Ross has also been able to align it in his Star-Mounds project to the constellation of Draco. Each curve of the serpent represents the extremes of the Sun and Moon rises and sets along the horizon and could have been used as a detailed calendar system. We met the legendary Ross Hamilton for the first time and he told me about a shaped rectangular megalith down the side of the bluff, that looked out of place and could have been once at the centre of the 'egg' effigy. It is interesting that when this site was discovered, there was a cairn of small stones at the centre of the egg. These were thrown down the side more recently because the grass cutter was getting annoyed by having to circle round them every time! The monolith, on the other hand, must have involved a team to move it out of position and throw it down the side of the bluff. Jeffrey Wilson and Ross discovered it whilst walking one of the trails in 2007. It looked remarkably like the 'Manitou' stones I had seen in New England, with a deliberate notch on the top of it, suggesting it was once an important monolith. We investigated it and Ross tapped on one end of the stone, whilst I placed my ear against the other end, and the sound travelled along to the other end, with a hollow sound. Ross proclaimed it was 'tuned' and would be an ideal lightning receiver upon the Serpent Mound. I felt it was the missing piece of the puzzle and would have acted as the greater axis-mundi or 'sacred centre' of the whole Ohio valley. It would have been the only megalith of its kind in the area, and I had a strong feeling it needed to be replaced back upon the egg of Serpent Mound to re-integrate the energies of the Serpent (earth spirit) and the Thunderbird (sky spirit). From where the megalith is, the overhanging rocks near the head of the Serpent, actually look like a snakes head. Did this inspire the location of Serpent Mound? The park was now closing, so we stopped at a classic American diner for some food, and I followed Ross back to his home in Silverton, Ohio, where we talked for as long as we could about the mysteries of the Ohio landscape, the deep prehistory of America and the 'star people', before getting to bed. My dreams were strange that night. I was with a group of people and building were being blown up, and we had to escape in my camper-can to get water and food, but the military blocked our every move. Was it prophetic or was it from watching too many Hollywood films? Whatever it was, it got me thinking about how strange and contrary the great US of A really is. The Serpent Simulacra, on the cliff below Serpent Mound, viewed from where the fallen Megalith is. Last Thursday we travelled through five US states. Connecticut, New york, New Jersey, the entire length of Pennsylvania and West Virginia. We knew it would take a full day to reach the enigmatic Grave Creek Mound of Moundsville, West Virginia, to begin our exploration of the sites of the Ohio Valley. This particular mound featured on the poster for our 2011 Conference in Glastonbury, Connecticut, so it was appropriate that we made that our first stop on the trip. However before we left Connecticut, we had heard about some interesting finds that have been discovered in New England. Jim Vieira outlines these in his excellent video lecture on the previous blog post, and this realisation that giant skeletons have been found all over North America altered my whole view of this country. Just knowing there was a race of Giants in North America thousands of years ago, is one of the most revelatory experience I have gone through. Knowing that this information has been deliberately suppressed, also snapped something in me, realising that there is a deep-rooted agenda to keep this not just quiet, but silent. 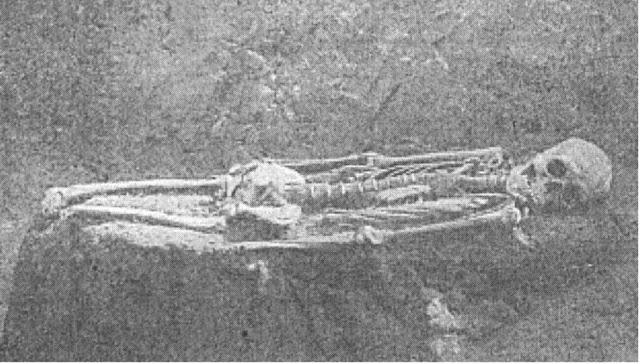 Jim Vieira's latest article in Ancient American (issue 95) described "Giant skeletons in Gill and East Hartford, CT, a seven-foot-tall skeleton with double rows of teeth at the Fort River burial site in Hadley, Ma. with all the bone dimensions listed." He says: "Interestingly, the Pocumtuck Valley museum had actual giant skeletal remains on display up until a few years ago. The museum’s 1886 catalog of curiosities and relics states it had a giant skeleton from Gill, Massachusetts, and the skull, jawbone and thighbone from an “at least” eight-foot skeleton from Marion County Ohio. These remains were re-interred fairly recently, as part of the Native American Graves Protection and Repatriation Act." Jim has recovered several other old reports of these types of skeletons in Vermont, Massachussets, Maine and others in Connecticut. Pennsylvania has its share of mounds and giants too. We headed briefly through New York and New Jersey (where there are also reports of giant skeletons, mounds, megaliths and many other fascinating mysteries), but spent most of the day cruising through Pennsylvania. In 1822 in Bradford County, a sarcophagus measuring 9ft in length was discovered whist digging a cellar. A skeleton 8ft 2in tall was discovered inside. In Harrisburg, two large skeletons were discovered in 1880 that measured 11ft 8 in. Further northwest in Erie County many giant skeletons have been reported, including one of "8 to 10 feet tall". On Fisher Farm in Bradford, many skulls were found that could fit over the heads of the discoverers, plus thigh bones a lot longer that the average. In 1883 at Sterling Run, skeletons up to 7 1/2 feet were discovered whilst digging a basement. All over the state were reports of this incredible race of giants, who's territory spread throughout the mid-west into Ohio and beyond. We reached the border of West Virginia and drove through Wheeling, a town that felt was very weird and probably haunted. A few minutes later we arrived in Moundsville, tired and weary, and as we approached the main street it started raining heavily and a lightning storm began right over the town. We went to both Motels and none had any rooms for the night. We found the 'Wheeling Inn', a run-down old-style hotel, with a tatty outside, right next to an old bridge, but a clean and tidy motel room with fast wifi. We felt like we needed 'wheeling in', as we were so tired. After breakfast, we made our way to Moundsville, spotting a megalith in one of the side streets (we got lost), and I knew that we should ask permission to enter this sacred space. it was granted, and the sun shone brightly for the rest of the day. After getting lost again, we arrived at the largest conical mound in North America, with a famous haunted prison directly behind it. The mound is 70ft tall with a diameter of 295 feet, weighing in at 60,000 tons and was part of a wider complex of mounds, octagonal earthworks and some stone towers up on the bluffs overlooking the town and the river. This would have been a clear warning for those entering this territory by boat or land. The Mound once had a moat or henge around it, that would have made it look a lot like Silbury Hill. The first excavation took place in 1838, that yielded two large skeletons, the female one wearing copper arm rings, and buried with various ornaments. 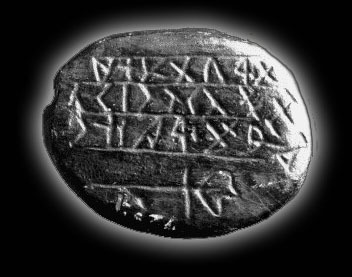 The enigmatic Grave Creek Stone was discovered at the same time, that was only a few centimetres wide, but powerful enough to potentially rewrite the known history of America. It was written in ancient semitic script, that Harvard epigrapher Barry Fell pronounced was Punic or Phoenecian, used somewhere along the Iberian peninsula somewhere around 1000BC to 100BC. It appears to be a greeting from a European, or British Queen to the Leader of the Adena people, who got buried in Grave Creek Mound. Was she perhaps from the 'Silbury Hill' culture of England and was it a meeting of the trans-atlantic Giant Royalty? Its odd how Silbury Hill is a unique feature in the Megalithic landscape of Britain, so perhaps, it was inspired by the mounds of North America. Several other giant skeletons have been found in nearby mounds in this part of West Virginia and there are least twenty more reports from other sites in the area. Check this book for details of those - The Nephilim Chronicles: Fallen Angels in the Ohio Valley, by Fritz Zimmerman. Strange energies, ghostly sightings, men in black an even Mothman type hauntings have been reported around the mound, with a prison built right next to it that has become a paranormal hotspot. Television programs have used it for ghost hunter shows and it is said that the ghosts of inmates who have died there are often seen there. A notable example is the 'shadow man', who was spotted and photographed by several people that even responded to human interaction. See short video here. The area around Grave Creek Mound may be a large graveyard for an incredible race of giants, so it's no wonder there has been paranormal activity at the nearby prison. I felt as sense of that power on the night we arrived, when we were surrounded by lightning and thunder. It was as though the great serpent and the thunderbird were telling me to come back the next day with a little more respect for the legacy that the mound builders have left for us to explore. After a hot afternoon filming, dowsing and photographing the mound, we headed south along the river to Marietta, a beautiful town that was built over a geometric mound complex that had great 'squares' and 'circles' that were now hidden within the foundations of the town. Said to be a Hopewell site (c. 100 BC) and located at the confluence of the Muskingum and Ohio rivers in Washington County. It consists of flat-topped 'cross' mounds, similar to step pyramids in Mexico, which one of them now acts as the foundations of a library. The greater squares are at most 1500ft wide. More details of the site can be found here. I drove around Marietta and saw numerous banks and earthworks that were the last remnants of this incredible site. It was here that Ross Hamilton, in his remarkable book, Star Mounds: Legacy of a Native American Mystery, noted that the constellation Centaurus had half of its stars beautifully overlaying the entire site, much like Orion mirrors the three pyramids of Giza, Egypt (as discovered by Robert Bauval). We continued on our journey to Peebles, Ohio to meet up with our couch surfer host Roy, who was putting us up for the night before we explored the great Serpent Mound the following day. After an outdoor hot-tub and chilling out in his beautiful house whilst he went to hang out with some of his musician friends, we eventually fell asleep, only to be awakened by something quite extraordinary in the middle of the night. 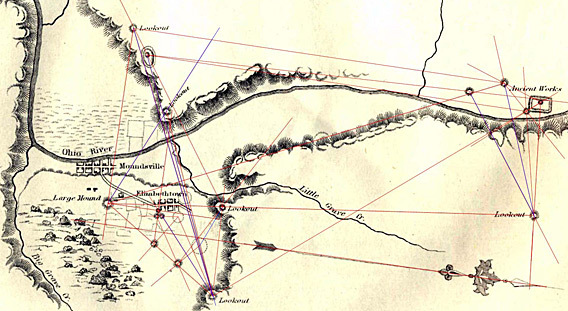 I wrote this last year, but it gives a good overview of the megaliths of New England. I originally explored the area in 2008, and again in 2011. We then organised our first US conference in Glastonbury, Connecticut with Jason Matozzo. It was here I met Sheena...and now we are road-tripping together in 2012 exploring the Mound culture sites. Since I wrote this, much more has been discovered, check out this video by Jim Vieira here. When you think about stone circles, dolmens or chambered tombs you would presume it is a European phenomenon. However, megalithic sites exist all over the world and one of the most fascinating landscapes that they exist in, is in the north eastern states of America. New England and New York State have thousands of recorded megalithic and lithic sites (Mega = big, Lithic = stone) that according to archaeologists simply should not be there. The predominant structure is the 'stone chamber' that are assumed to be 'Colonial Root Cellars', suggesting that they were built by European settlers to store their vegetables in! This has been mostly dismissed for a number of reasons: there are no air vents, the floor is often bedrock, they are built upon magnetic anomalies, and the huge megaliths that often make up the lintels are of no apparent use to 'root cellars'. Whoever designed and built them had a specific purpose in mind. Being an English Antiquarian, I find it difficult to accept that academics remain ignorant and therefore do not protect these sites from road-widening schemes and other construction projects. I have a huge respect for the work NEARA (New England Antiquities Research Association) carry out, protecting the sites and educating the public about the significance of what might be in their back garden. Often these sites are on private land and one of the conclusions I reached by the end of my initial exploration, was that this was possibly the safest place for them to be. It is generally accepted by researchers that these sites were built by the Native American populations of the area a few hundred years ago, but carbon dating, archaeoastronomical alignments, scientific earth energy tests and oral histories have pushed the dates much further back than originally thought. 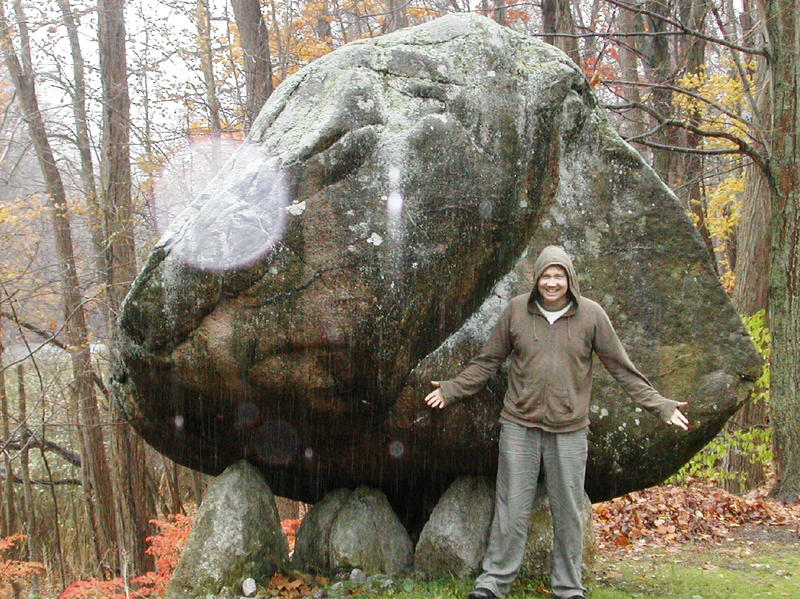 Back in 2008 my megalithic quest began in Vermont. I had already researched many of the sites we planned to visit, so first on our agenda was Calendar I, a fascinating megalithic complex spread out over a hilly area near Woodstock, Vermont. Larry Bohlen and I approached the initial chamber that was on private land with Zechia Blackburn, a local geomancer. We spotted a boulder which was the 'entry stone' so we approached that first and made an offering of tobacco, before we entered the chamber through a very small hole. Zechiah then led us through some sacred songs and meditation that truly welcomed us into this ancient landscape. I unholstered my dowsing rods and found telluric energies and three major energy currents that criss-crossed the site. The telluric lines (as with most other megalithic sites I have visited) bounced off the larger stones inside the chamber in a zigzag fashion and out of the chamber forming a spiral at the entrance. Telluric currents are currents that run across the surface of the earth and are attached to the magnetic field. They fluctuate in strength throughout the day, and when harnessed, the energy can be used to alter consciousness and even affect the fertility of seeds and grains if placed correctly. Several sites in New England were tested by John Burke and Kaj Halberg whilst researching for their book 'Seed of Knowledge, Stone of Plenty' (Council Oak Books, 2005). They used sophisticated Magnetometers and Electric Volt Readers and discovered one of the lost technologies of the ancients - controlled fertility of seeds using natural earth energies. Dowsers have known for years about these energies, but have often been ridiculed by the academic fraternity. Since their results were published in 2005, the academics have become mysteriously quiet. Zechiah took us to the 'Eagle chamber' nearby, that had a complex of stones, a crystal pathway, and was thought of as a 'pregnant' energy site. It reminded me of a chamber I had visited in the Mayenne region of France. Chambers like the ones in New England also exist in Ireland and England, with features that are consistent with Neolithic and Bronze Age construction techniques. The ambience there echoed Calendar l, with telluric energies bouncing around the chamber and a major energy current sweeping through the site that did an anti-clockwise turn inside. Larry and I totally relaxed there and both nearly fell asleep. We walked up to another chamber that was roofless that showed signs of astronomical alignments with the surrounding features. 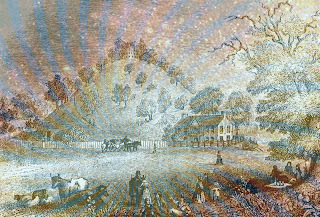 In the groundbreaking book Manitou: The Sacred Landscape of New England's Native Civilization (Inner Traditions 1989), Byron E. Dix and James W. Mavor carried out a thorough survey of the Calendar I complex and concluded that not only was it aligned to the eight turnings of the year, it showed evidence of tracking the 18.6 year lunar cycle, suggesting a sophisticated group of astronomers built this complex. Some of the initial dating of the lower layers even produced a date of around 8,000 BC (1). Calendar II is a nearby megalithic chamber that has much larger stones making up the interior lintels. This is the biggest chamber in Vermont, measuring ten feet by twenty feet. This ratio of 20:10 / 2:1 is found in the King's chamber of the Great Pyramid (2).There are seven massive lintel stones that span this width and the entrance is aligned to the Winter Solstice sunrise. According to Mavor and Dix, it can also be used as an eclipse predictor and for lunar observation. Thanks to its new name, 'America's Stonehenge', (formerly 'Mystery Hill') has become the most famous megalithic structure in New England. It is a vast astronomical complex based in North Salem, New Hampshire, with standing stones, a sacrificial table, stone chambers and astronomical alignments. Rob Stone bought the land in the 1950s and turned it into a national monument. We met his son, who now runs the place and he looked jaded by the school busses that frequent the site and seemed hesitant to talk to us. However, when I mentioned the names of 'earth mysteries' authors John Michell and David Hatcher Childress, his eyes lit up. We got chatting and he told us that carbon dating of the site over the years put the time frame from 2000BC to 200AD. Unknown megalithic builders constructed a 12-acre astronomical stone calendar for purposes we can only guess at. Who the builders were, why they left, and what happened to them after that are still a mystery. Surrounding the site are various megalithic markers that accurately align to sunrises and sunsets of the eight festivals of the year. 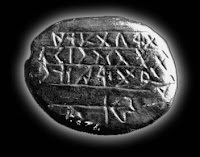 In 1975 the "true north stone" was determined to have lined up with the then Pole Star Thuban, dating to around 1750 BC (3). It is believed that at that time period, a very large body of water, which was fed by the Merrimack River, shored near the Mystery Hill area. This would have made it accessible by ships from overseas. It is believed that Phoenicians, Celts, and possibly the megalith builders came from across the seas and settled here long before the discoveries of Christopher Columbus. The style is again very similar to European megalithic sites. A notable feature is the "T" shaped "oracle" chamber that has an unusual speaking tube that comes out below the 'sacrificial table', a 4.5 ton block of granite that is said to have been used for sacrifice! Magnetic anomalies have also been recorded at the entrances to most of the chambers, similar to other sites in New England.(4). We noticed two posters in the shop showing the location of two other local sites; one was a stone chamber at the back of the Department of Public Works car park. The other was a potential stone circle. The quest was on. We jumped in the car and decided that going through an 'off limits' area with large biohazard signs was worth the risk to see the 'Danville Beehive'. It is a small chamber, overlooking a valley of trees and a putting green at the end of someones garden. An energy line entered through the entrance and did its usual magic. After that we visited the stone circle at Pelham in LeBlanc Park, next to a football field. It is a raised oval earthwork with several upright stones marking out the shape, but I later discovered it had been moved from its original site, a few hundred yards away, but put back in the same style and geometry to how it had been originally discovered. Our next stop was in North Salem, New York State, to check out the largest Dolmen in the Americas. Balanced Rock is a huge perched boulder and looked incredibly out of place along Highway 116 next to a Fire Station. Unbelievably, the official sign said it was believed to be a glacial erratic but did not explain how it happened to land on five quartzite boulders that are sub-divisions of the 'Megalithic Yard' apart (2.72feet). This place completely woke me up. It has a profound energy, all 90 tons of it. Burke recorded a negative magnetic anomaly below the dolmen and a higher than usual magnetic field around it due to the local geology. It sits upon a split in two types of geology, what Burke calls a 'conductivity discontinuity', where telluric energies suddenly switch from electric charge to high magnetism and vice versa. It's as though a magnetic iron ball is buried 20 feet below the dolmen. My TriField magnetometer picked these up clearly. Larry even captured orbs in the first photo with me next to it without a flash. The dolmen looks European in style and the huge capstone may have been transported here by manual labour from a great distance (as with the blue stones of Stonehenge for instance). 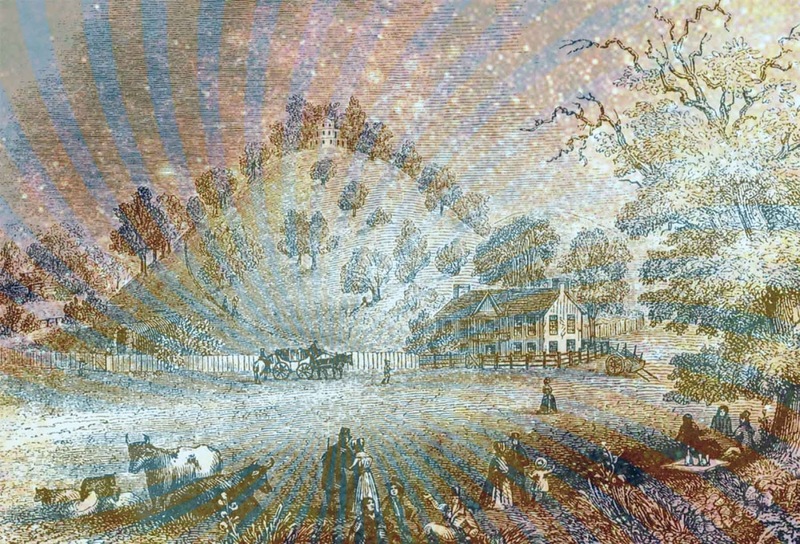 Orbs and ghostly sightings have been associated with it for some time, but whoever built it and how they did it stretches the imagination because Native Americans are not known to have worked with stone in this way. I firmly expect it will be proven that this is a neolithic or bronze age structure that was used to enhance seed production and a trading post for local (and possibly regional) tribes. Larry and I walked up to an art gallery nearby and were told that on a monthly basis, accidents happen in a small stretch of road outside the building, which is on the edge of the 'magnetic zone' around Balanced Rock. The owner also explained how she always felt storms (or microbursts) brewing in that close vicinity, but never affected the rock. She phoned up a woman called Rowly who lived opposite the rock for many years who told us she felt and saw 'waves' emanating from it and that when she held healing sessions in her home the rock would be in view and somehow give her power. The gallery owner also told us how five years ago an astrophysicist, geologist and microbiologist visited the site to carry out tests, but would not say what they were doing there. Could it be they knew it was a fertility generator, or a weather influencing device? She left us with an uplifting message; that she had never felt such a positive energy anywhere else she had lived. Further down the road was 'Giants Grove', suggesting an ancient legend of giants building such megalithic structures, as we frequently get in the UK. We then went on to Kent Cliffs in Putnam City, NY state. Here were several megalithic chambers similar to Calendar I that were just on the sides of major roads. If you stepped out of one of them in daze, it could be the last site you ever visit! It was dusk as we approached the first one that was on Highway 301 and took a few photos that immediately showed several orbs in them. Burke had photographed plasma bands at this one and it was constructed upon a negative magnetic anomaly. The magnetometer was picking up fluctuations inside and outside the chamber and we even dowsed the differing levels of +charged ions and -charged ions in the air. A major energy line went into the entrance and did an anticlockwise spiral in the chamber. Telluric lines zigzagged off the larger stones along the bottom of the chamber. Further down the road towards Carmel, another chamber lay hidden in the undergrowth that Burke had tested. It was nighttime now and was hard to make out the construction style, but with a torch, I saw that this was a taller design with very large blocks making up the roof. Again I noticed the magnetite ore strips (lodestone) going through the rock. Burke saw these as significant because they enhance the magnetic power of the site. In Nineham State Park, just 100 yards from its entrance was a stunning chamber. It had a huge megalithic ceiling made up of magnetite with an 8ft wide menhir at the back. The chamber was approximately 25ft long by 10ft wide. It was dark and the camera picked up no orbs, but a major energy line ran through it with telluric spiral outside the door and zigzags of energy inside. Burke captured an infrared photo of a strange hovering ball of light that was invisible to the naked eye. He decided to place Iriquois Blue Corn seeds directly below where this orb was photographed to see if it would have any effect on them when grown. To his astonishment, a few months later he found that the seeds placed here for 75 minutes had a three-fold increase in yield, compared to controls (5). The whole area is a magnetic powerhouse with fluctuations in the geology stretching across the entire mountain area (6). This may be why there has been so many stories of strange lights and UFO sightings attached to this area. Phil Imbrogno collected hundreds of reports documented from 1983 to 1995, that ranged from colossal triangular crafts to smaller 'intelligent' lights that often travelled through the sky and landscape in groups. When they traced the source of where these lights originated, there would always be an ancient megalithic chamber to greet them. Phil Imbrogno recounts a meeting with a 90 year old medicine man who was one of the last remaining tribes-people from the area around the the chamber. For centuries, the base of the mountain was the home of the Wappinger Tribe, who were part of the Mohegan and Delaware cultures (7). He recounts his initiation in the chamber in 1910 when his teacher told him about the strange men who arrived from the direction of the rising sun with faces of fire (ginger facial hair?) and eyes like the sky (blue eyes?). They were much larger than the local tribespeople and they were the ones who built the chambers. It is said the stones were moved with "spirit power and a great wind" and they would summon spirits (or orbs) to come into their fire circles. Then after a great exchange of knowledge they were gone and were fondly remembered by the tribes. (Imbrogio p.76). On his vision quest when he was upon the mountain for a few days, some lights circled around him which stood at a man's height and eventually formed into spirits who had long white hair and glowed with light. He also stated that he had an out of body experience and was able to heal a boy from a great distance. A similar encounter happened in January 1990 when a man was lost in a powerful blizzard and was fighting for his life. A circle of lights surrounded him and the next thing he knew, he woke up near the Rangers Station 45 minutes later (8). Whatever these light are they seem to be connected with the chambers and magnetic anomalies suggesting that they may act as 'portals' to other levels of existence. Science is starting to catch up with and understand the purpose of these incredible sites in New England. Whoever built them, their secrets are still hiding behind a fascinating megalithic curtain that is yet to fully reveal itself. We know that the builders were adepts of astronomy, megalithic construction and had an understanding of natural earth energies and shamanism. It is now time for the archaeologists to step up to the challenge and take another look at these sites for what they truly are. These sites were built to last, not only as astronomical observatories, initiation chambers or portals to otherworlds, but sacred places where offerings were made of grains and seeds, to secretly enhance the fertility of their crops. A real Colonial Root Cellar!!! I arrived in Boston on the night of 29th August, having fled England on the trail of the Dragon Clan, mound builders and the mysterious megalithic giants of ancient legend. Sheena met me at the airport and we checked into the 'Presidential Motel' before starting our quest the following morning. We drove to downtown Quincy and spotted a huge granite megalithic ball outside the town hall. It was carved in 1925 and said to be "The most nearly perfect carved sphere in the world". It reminded me that we would be visiting a much more ancient selection of 'megalithic marbles', when we visit Costa Rica in late November. I knew of a Gravestone in Quincy, Massachusetts that had written evidence worded by the second president John Adams, about his father, Henry Adams. It described fleeing England during the "Dragon persecution" that is believed to have resulted in bringing a secret, higher, esoteric knowledge to the New World, and extending this enchantment into a "New Atlantis". A group involving John dee, Christopher Llwyd, Sir. Walter Raleigh, Christopher Marlowe, Francis Bacon and even Queen Elizabeth ll, called themselves the 'Dragons', an esoteric clan who resided in Somerset and Devon in the 1600's, who were an extension of "The Invisible College". They were keen on setting up a monarchy in America based upon esoteric principles. The Dragon philosophy appears to have been based upon Druid ideas that had an understanding of leys, geomantic earth energies, and how to influence these for a higher purpose. The inevitable persecution that started soon after, pushed some of the Dragons over the Atlantic to North America. These influences were to be seen in the philosophy of John Adams, with his promises of creating a New World of peace, justice and education. Some of these principles were even built into the geometric foundations of Washington DC, as well as developing into a number of secret societies, that became quickly corrupted by power and greed and became the Skull and Bones society and the Illuminate groups that still hold on to that power. However, all is not lost, as the landscape of North America also encodes this secret enchantment, and has done for thousands of years....and it is waking up. We realise those that resided in North America were an incredibly sophisticated megalithic and mound building culture, and knew of the esoteric, geomantic, geometrical principles. Whether the Dragon Clan knew that they knew, or whether they ignored the Native Americans, the knowledge was still there and although much of it has now been desecrated, there is still much to explore in the earthworks and megalithic remains, as well as checking out artefacts, unusual inscriptions and even strange giant skeletons, with double rows of teeth and reaching heights beyond 8 feet. Hugh Newman is an earth mysteries and megalithic science researcher. He organises the Megalithomania Conferences, tours and meet-ups in Glastonbury, UK, North America, Peru, Egypt, Mexico and South Africa. His most recent book, Earth Grids has been published by Wooden Books. He has spoken at conferences in the UK, Malta, France, Peru, Bosnia, and North America. He has appeared on BBC TV, Sky Channel 200 and on History Channel’s “Ancient Aliens” in the last three seasons. He has articles published in The Leyhunter (UK), World Explorers Magazine (US), The Circular (UK), Mindscape Magazine (UK) and Northern Earth (UK). He is currently writing a book about the Wandlebury complex near Cambridge, UK, and getting ready to explore Turkey, Wales, ancient England, Italy, then on to Peru and Bolivia in November. Copyright Hugh Newman 2012. Picture Window theme. Powered by Blogger.